TEGUCIGALPA, Jul 18 2014 (IPS) - The migration crisis involving thousands of Central American children detained in the United States represents the loss of a generation of young people fleeing poverty, violence and insecurity in Honduras, Guatemala and El Salvador, the countries of the Northern Triangle of Central America where violence is rife. Some 200 experts and officials from several countries and bodies met in Tegucigalpa to promote solutions to the humanitarian emergency July 16-17 at an International Conference on Migration, Childhood and Family, convened by the Honduran government and the United Nations Children’s Fund (UNICEF). The conference ended with a call to establish ways and means for the countries involved to implement a plan of action with sufficient resources for effective border control and the elimination of “blind spots” used as migrant routes. They also called for the rapid establishment of a regional initiative to address this humanitarian crisis jointly and definitively, in recognition of the shared responsibility to bring peace, security, welfare and justice to the peoples of Central America. But the declaration “Hoja de Ruta: Una Invitación a la Acción” (Roadmap: An Invitation to Action) does not go beyond generalisations and lacks specific commitments to address a crisis of unprecedented dimensions. The U.S. government says that border patrols have caught 47,000 unaccompanied minors crossing into the United States this year. They are confined in overcrowded shelters awaiting deportation. José Miguel Insulza, Secretary General of the Organisation of American States (OAS), told the conference that in 2011 there were 4,059 unaccompanied minors who attempted to enter the United States. But this figure rose to 21,537 in 2013 and 47,017 so far in 2014. “These huge numbers of children are from Mexico, Guatemala, Honduras and El Salvador. According to the data, 29 percent of the minors detained are Hondurans, 24 percent are Guatemalans, 23 percent are Salvadorans, and 22 percent are Mexicans,” said Insulza, who called for the migrants not to be criminalised. Images of hundreds of children, on their own or accompanied by relatives or strangers, climbing on to the Mexican freight train known as “The Beast” on their way to the U.S. border, finally aroused the concern of regional governments. The U.S. administration’s announcement that it would begin mass deportations of children apprehended in the past few months was also a factor. Honduran minors began to be deported on July 14. 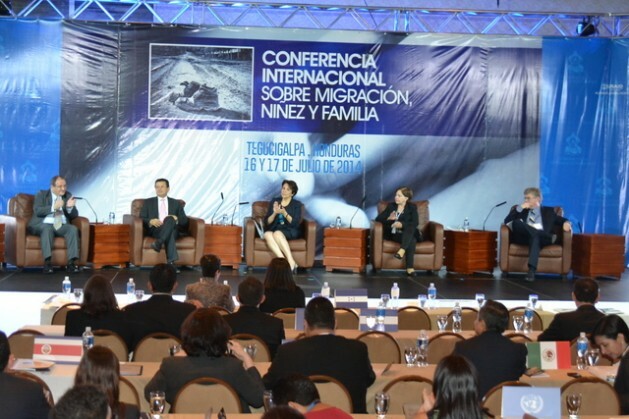 The Tegucigalpa conference brought together officials and experts from countries receiving and sending migrants. According to analyses by participants, in Guatemala migration is motivated by poverty, while in El Salvador and Honduras people are fleeing citizen insecurity and criminal violence. Out of every nine unaccompanied minors who cross the border into the United States, seven are Hondurans from what are known as the “hot territories” of insecurity and violence, the president said. Ricardo Puerta, an expert on migration, told IPS that the Central American region is losing its next generation. “This is hitting hard, especially in countries like Honduras where people are fleeing violence and migrants are aged between 12 and 30. “We are losing many new and good hands and brains, and in general they will not return. If they do come back it will be as tourists, but not permanently,” he said. Laura García is a cleaner. She earns an average of 12 dollars for each house or office she cleans, but she can barely get by. She wants to emigrate, and does not care about the risks or what she hears about the hardening of U.S. migration policies, whose officials endlessly repeat that Central American migrants are “not welcome”. “I hear all that, but there is no work here. Some days I clean two houses, some days only one and sometimes none. And as I am over 35, no one wants to give me a job because of my age. I struggle and struggle, but I want to try up in the North, they say they pay well for looking after people,” she told IPS in a faltering voice. She lives in the poor and conflict-ridden shanty town of San Cristóbal, in the north of Tegucigalpa, which is controlled by gangs. After 18.00, they impose their own law: no one goes in or out without permission from the crime lords. “They say that a lot can happen on the way (migrant route), attacks, kidnappings, rapes, they say a lot of things, but with the situation as it is here, it’s the same thing to die on the way than right here at the hands of the ‘maras’ (gangs), where you can be shot dead at any time,” Garcia said. At the U.S. Conference of Catholic Bishops in Washington on July 7, Honduran cardinal Óscar Andrés Rodríguez Maradiaga spoke about the despair experienced in Honduras and the rest of Central America. “It is like someone has torn open an artery in Honduras and other Central American countries. Fear, grinding poverty and no future mean we are losing our lifeblood – our young people. If this continues to happen, the hearts of our nations will stop beating,” said the cardinal in a speech that has not yet been disseminated in Honduras. Rodríguez Maradiaga criticised the mass deportations of Honduran children who have started to arrive from Mexico and the United States. “Can you imagine starting your adult life being treated as a criminal? Where would you go from there?” he asked. The Catholic Church in Honduras has insisted that fear and extreme poverty, together with unemployment and violence, lead parents to take the desperate measure of sending their children off on the dangerous journey of migration in order to save their lives. The Church is demanding inclusive public policies to prevent the flight of a generation. Violence in Guatemala, Honduras and El Salvador is considered to have grown as a result of the displacement of drug trafficking cartels from Mexico and Colombia, due to the war on drugs waged by the governments of those countries. In 2013, the homicide rate in El Salvador was 69.2 per 100,000 people, in Guatemala 30 per 100,000 and in Honduras 79.7 per 100,000, according to official figures. At present over one million Hondurans are estimated to reside in the United States, out of a total population of 8.4 million. In 2013 remittances to Honduras from this migrant population amounted to 3.1 billion dollars, according to the Honduran Association of Banking Institutions.